UPDATE!!! 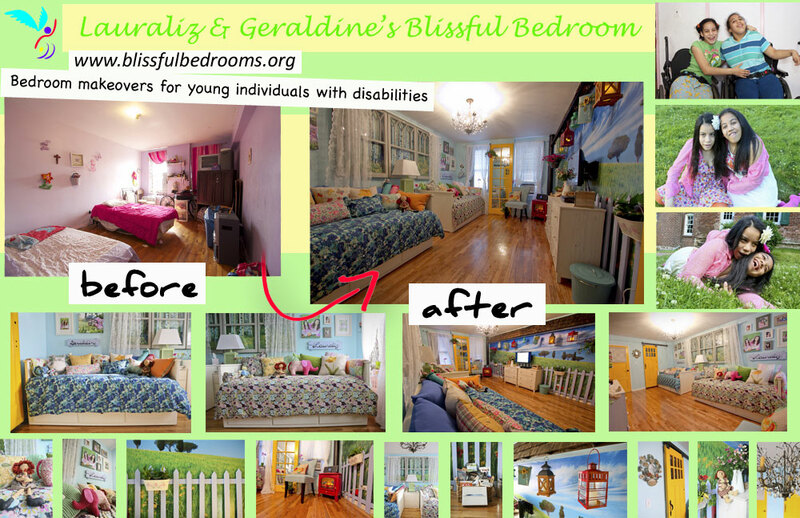 During the weekend of 6/22-6/24/12, a team of Blissful Bedrooms volunteers – TEAM LALA & GIGI – made a double dream come true for two very special sisters. We gave Lauraliz and Geraldine the Country Cottage themed bedroom of their dreams! More than 30 dedicated and talented volunteers joined hands to make LaLa and GiGi’s desires and wishes their own. Countless other individuals/companies made donations to invest in Lauraliz and Geraldine’s happiness – LaLa & GiGi’s Angels – making it all possible. The girls’ room is now a cozy and comfy respite that feels as though it is lovingly nestled in the tranquility and beauty of nature – a special and serene place created exclusively for them. Lauraliz and Geraldine now have a sanctuary, of which they were the master designers, a place where they can retreat to and feel rejuvenated, happy, inspired and peaceful. Because of the unique circumstances and desperate need of this disadvantaged family, we invested extra energy and resources into refreshing the rest of the apartment. Blissful Bedrooms volunteers de-cluttered, organized, cleaned and painted the living room, kitchen, hallway and bathroom. In addition, we re-decorated and furnished the living room. We have no doubt that this extra exertion will lead to profound benefits and positive change in the quality of life of this captivating family. Even more remarkable is that we wrapped our collective arms around Lauraliz, Geraldine and their Mom, and left their home with a palpable and all-pervading, loving and compassionate energy that is guaranteed to linger for a lifetime, and send ripple effects out into the world. LaLa and GiGi, may all of your days be blissful and may you enjoy much happiness and contentment in your Blissful Bedroom! 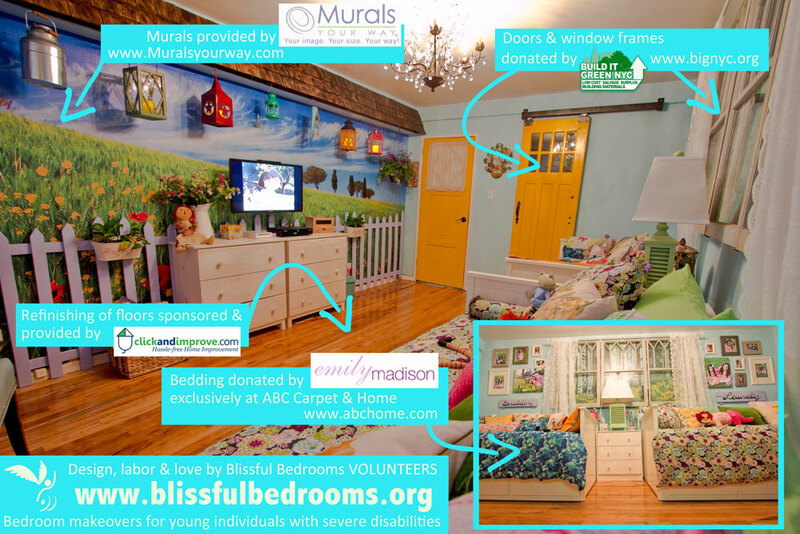 Blissful Bedrooms is extremely excited about this very special “double” makeover we will be doing for two sweet and deserving young ladies in June, 2012. Lauraliz and Geraldine are endearing and affectionate sisters, and it is incredibly heartwarming to witness the devoted, love-filled bond that they share. Although at 21 years of age, Lauraliz is the older sister, Geraldine, 16, is clearly the advocate and compassionate leader of the duo. Sadly, both girls are disabled and face similar life challenges. They have cerebral palsy and are highly dependent for all activities of daily living. Cerebral palsy (CP) is an umbrella term for a group of disorders affecting body movement, balance and posture. CP is caused by abnormal development or damage in one or more parts of the brain that control muscle tone and motor activity (movement). The resulting impairments first appear early in life, usually in infancy or early childhood – infants with CP are usually slow to reach developmental milestones. Common to all individuals with CP is difficulty controlling and coordinating muscles. This makes even very simple movements difficult. Cerebral palsy may involve muscle stiffness, low muscle tone, uncontrolled movements and problems with posture, balance, coordination, walking, speech and swallowing. Mental retardation, seizures, breathing problems, learning disabilities, bladder and bowel control problems, eating difficulties, dental problems, digestive problems, and hearing and vision problems are often linked to CP. The severity of these problems varies widely and is unique to each individual diagnosed with CP. Of the many types and subtypes of CP, none has a known cure. Usually, medical intervention is limited to the treatment and prevention of complications arising from CP’s effects. Lauraliz or “La La” as she is tenderly nicknamed, has ataxic cerebral palsy, which affects balance and coordination. She has low muscle tone and difficulty with movements that are quick or require a great deal of control. Although Lauraliz uses a wheelchair as a primary means of mobility in the community, she is very determined to move about and is able to walk independently inside of her home, albeit with a very unsteady and shaky gait. She must hold onto the walls and furniture to stay upright and is no stranger to falling. Thus, it is important to make sure that her environment is safe. Geraldine, aka as Gi Gi, has a mixed type of cerebral palsy – ataxic and athetoid. In addition to low muscle tone throughout her body and challenges with balance and coordination, she also experiences uncontrolled and involuntary movements, which greatly impedes her function. Just like Lauraliz, Geraldine depends upon a manual wheelchair for mobility out in the world. She can also walk short distances, but requires more support than Lauraliz, either a person holding on to her arm or adaptive equipment such as a gait trainer. Both girls currently attend a Distict 75, Special Education School and have done so since a very young age. Lauraliz is graduating this year and come June will abruptly transition from her regular routine of going to school everyday, enjoying attention, stimulation and socialization, to a precarious and uncertain future. As of yet, Lauraliz has not been accepted to an adult day program and there is no guarantee that she will any time soon. The reality is that she will be spending a lot more time at home, in her bedroom, than she is used to. Geraldine still has another five years of school (students graduate at 21 from District 75 schools) until she faces the same dilemma. The girls currently do not have any opportunities for leisure or socialization with friends outside of school. Thankfully, they have each other to lean on, but we know they will greatly benefit from having a community of peers to be part of and we welcome them wholeheartedly into the Blissful Bedrooms family! Lauraliz is mostly non-verbal, although she can speak a few words. However, she has good receptive language and generally understands and responds visually to others talking to her. Geraldine is verbal, and often translates for Lauraliz ☺, however she has difficulty articulating and frequently others who do not know her well have a hard time understanding what she is saying. But that does not stop her from trying to communicate with others. Geraldine is very social and enjoys interacting and talking with people. Both girls are really expressive and able to communicate quite well via body language and facial gestures, such as the big, radiant smiles they commonly wear on their faces, especially when they are with each other. Lauraliz and Geraldine live in a small, low-income, two-bedroom apartment in the Bronx with their single mother Maria, who certainly has her hands full caring for the girls all alone. Maria is a loyal and caring mother and simply adores her girls. It takes about five minutes of knowing this lovely lady to understand why La La and Geraldine are so secure and joy-filled. Watching mom interact with her daughters with such patience and warmth is truly awe-inspiring. In fact, being in her presence and observing her kind and lighthearted demeanor, one can quickly forget the insurmountable challenges this woman faces on a daily basis. When asked how she manages to be so genuinely happy and cheerful considering the obvious difficulties she endures, Maria said it is her faith and belief that God is with her, by her side, and that she is where she is supposed to be. Geraldine told us that some of her favorite colors are blue, green and purple and that La La likes yellow. We also learned that the girls are fond of flowers and butterflies and want their bedroom to be a vibrant and happy place, sort of like a vacation room ☺. After talking at length with the sisters, as well as mom and caregivers at school, we decided that a Country Cottage theme would be a perfect fit for them. We plan to make their bedroom feminine and bright, and include the colors and beauty of nature. It is our hopes that La La and Geraldine will feel peaceful and content in their new bedroom. It is our goal to make it a place where they will not only experience rest and rejuvenation, but also a space where they feel inspired and optimistic about life. We will include various items to help keep them entertained, educated, fit and connected to the world, including a Wii playstation, a flat screen TV and an iPad. Geraldine uses an Ipad at school and is very excited about the prospect of having one of her own. We have no doubt that she will teach La La everything she knows and in no time La La will be as adept as her. One of the many beautiful things we noticed about these two sisters is that they have mastered the art of sharing and caring, so being joint owners of the iPad will not be a problem. 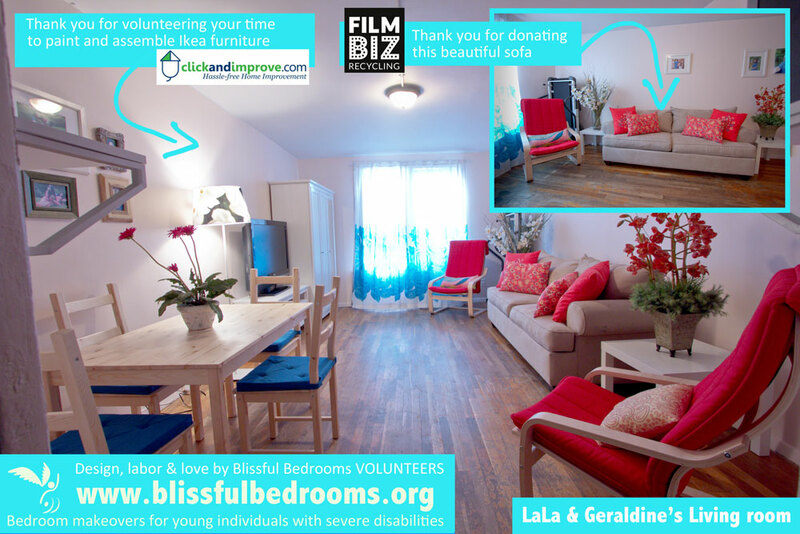 Please help us give La La and Geraldine a Blissful Bedroom during the weekend of 6/22-6/24/12 and serve up a double dose of happiness in one shot! We need your help and support to build their dream. Won’t you please contribute by making a general donation of any amount today or donating the funds for a specific item – just click on the Paypal link below. If you have any ideas or resources you would like to share, please do not hesitate to contact us. We would love to hear from you!! Please take a few minutes to view the photos from LaLa & Geraldine’s makeover weekend, which include Before & After photos of their bedroom, pictures of the details, the girls’ reaction to the Revealing of their bedroom, the Reveal party celebration with past Blissful Bedrooms makeover recipients, friends and supporters and the volunteers in action transforming the bedroom. On June, 17, 2012 – Father’s Day – a group of kindhearted Blissful Bedrooms volunteers shared their time and talents, and collaborated to make this an unforgettable day of beauty and fun for LaLa, Geraldine and their mother, Maria. Sincere thanks to LaLa & Geraldine’s Photo Shoot Team for dedicating their day to this family, and for contributing to making the girls' spirits and self-esteem soar to new heights. Thank you to all of the compassionate and caring volunteers who shared their time and talents to make a dream come true for LaLa and Geraldine! Thank you to all of the generous ORGANIZATIONS/BUSINESSES and INDIVIDUALS who have supported LaLa and Geraldine’s bedroom makeover by donating funds, services and/or materials. This makeover could not have been possible without your help! Thank you to the Companies and Individuals who have adopted Blissful Bedrooms donation boxes, and to the generous and giving customers/people who contributed to the boxes. You helped us manifest LaLa & Geraldine's dream bedroom!